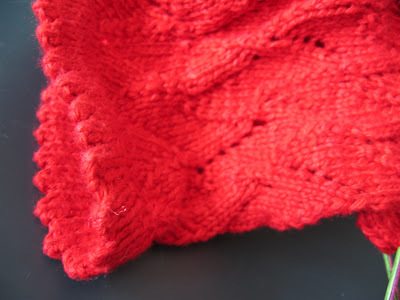 So I have been experimenting lately with different things...mostly with sock patterns...since it is the last few days of the fire element for project spectrum, I thought I would post a picture of some red socks I am working on using Eva - a blend of silk and cashmere - from Posh Yarn. 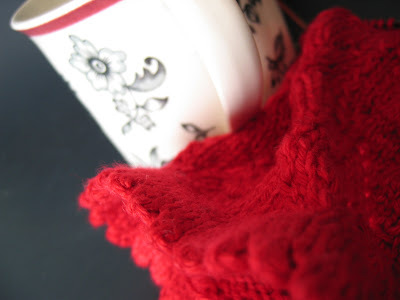 When I received the yarn it was so soft and the color rocked. It is supposed to be sock yarn -- it is the most disappointing yarn I have ever knit with!! First I tried to make the marina piccola socks from this yarn. I got a good chunk done and figured out I was knitting the pattern all wrong (so, okay, my fault), but the pattern was the worst ever for a yarn that basically has NO STRETCH at all. I ripped it out and tried again using one of my own patterns...the yarn kept splitting, it had no give...I cursed, and I am still cursing. That beautiful color .... is all over my hands, under my nails, on the pillow I lean on when I knit...At this point I am not certain if I should finish the socks, except that this pattern looks pretty nice, however, the yarn is a nightmare.